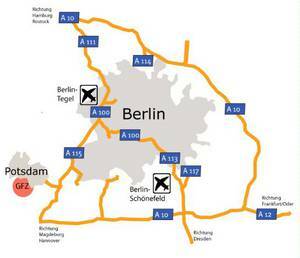 From Berlin take B1 from Berlin-Wannsee or the motorway "Autobahn" A115 to Hannover/Leipzig, exit Potsdam-Babelsberg; follow the signs to "Zentrum". Drive to Potsdam Main Station ("Hauptbahnhof"). Then see below, and satellite map on page "On Foot". From Hannover or Leipzig on motorway "Autobahn A110/E30", take exit "Potsdam-Süd/Michendorf" to Potsdam follow the B2 northbound, turn right at "Am Brauhausberg" till "Albert-Einstein-Straße". Turn right, and drive uphill until you reach the gate of the GFZ campus. From Hamburg or Rostock on motorway "A10/E55", take exit "Marquardt" to Potsdam along B273, follow in Potsdam the signs to "Zentrum" and pass "Landtag" and "Am Brauhausberg" entering the "Albert-Einstein-Straße", and walk uphill until you reach the gate of the GFZ campus. At the gate of the GFZ campus, just walk by the staff building (security). Register the license plate number with the staff. They will then open the gate. Our office building 'A69' is located on the far southern side of the campus.